Peter Gay. 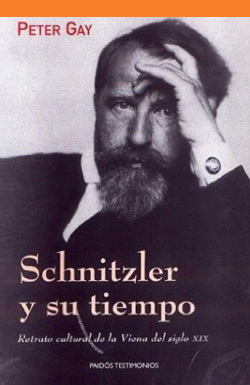 Schnitzler y su tiempo: retrato cultural de la Viena del siglo XIX. Barcelona, Paidós, 2002, 326 pages. Translated by Marta Pino Moreno. ISBN: 978-84-493-1289-2. Spanish translation of the original title: Peter Gay. Schnitzler's Century: The Making of Middle-Class Culture 1815-1914. New York/London: W. W. Norton, 2002. Published in Spanish by Paidós.